Many thanks to Mark O'Connor who filled us in with lots of information on Kallander Hill, which was also known as Private Property Keep Out No Trespassing Ski Area on Massachusetts lift Inspection sheets. This was mainly a private ski area for family and friends, and was owned by Peter Kallander. At one point, when the a state lift inspector arrived, they asked him what the name of the ski area was. According to Kevin Thomas, after some back and forth, Peter called it "Private Property Keep Out No Trespassing Ski Area". I actually once owned the farm that included the hill that the ski slope was on (long before I bought the property though). I was there with Peter Kallander, its owner operator, on what was likely the last occasion the rope tow was operational on that site. I think it was in the fall of 1983. Peter was the guy that built the lift and owned several hundred acres including the mountain. Kallander Hill, which it should be referred-to as, was north facing, and had two purposes. In the summer and the fall, Peter told me if the conditions were right, he would take his plane up the hill and take off. I never saw him take off on that side of the hill because my property was a few hundred yards south and west, and the ski slope faced pretty much due north. I did, however, help Peter clear the west side of the mountain in 1983. At that point he hadn't been operating the lift in the winter for a number of years. The lift was an old farm vehicle with its drive-train intact. I did see it, and I think we may have fired it up that day to see if it was still working properly. He showed me how it operated because he knew I was a life-long skier and had learned at a place like this in Dudley Mass near Nichols College, and at Mount Tom and Maple Valley. The rope was attached to one of the back wheels with its counterpart at the bottom. He'd just start it up and run it for his kids and their friends. I don't recall him ever saying if it was ever a commercial venture for Peter. It was likely just for his kids and for locals. Peter was a popular guy around town and had been the president of his class in high school. Betsy McDonough and I found the area in April, 2000. Here it is...with the rope tow going up through the pine trees on the right. Notice the plane at the end of the airstrip. We cut down a number of cedars that fall weekend, and I took them to use for a fenced-in paddock that I was going to build off my barn (which I never got around-to). 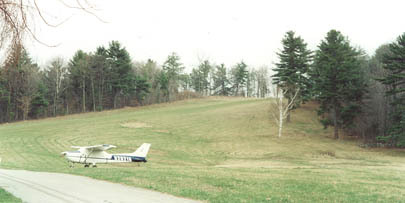 Peter then had a west-facing runway on Kallander Hill that could be used when the winds came from the other direction. I don't believe anyone ever skied on that, although I had planned to try it. My estimate is the hill had a vertical of at least 200-250 feet. On that day Peter gave me the history of the mountain that I note here. Over the next year I did see him take off from the part of the hill we cleared. I think he did that as a practice exercise for having to take off or land in extraordinary conditions. He had a house on Moosehead lake in northern Maine, and would fly up there regularly. Around the time I moved away a few years later he had purchased an amphibious plane (either a Lake or a Seabee), with a large prop high and behind the cockpit. I did see him taking off and even doing the last part of his landings on the side of the mountain with that and its predecessor plane, sort of like touch and goes. It was an amazing site for me and all the other neighbors that could see it. I think he bought the rear prop plane because there wasn't enough prop clearance on the west facing hillside given the steeper grade. Here's the Terraserver overhead pic (found by Betsy). 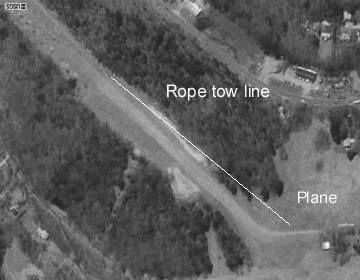 The location of the plane is noted, as is the rope tow line. Peter also told me that the mountain was his retirement, so that would explain why he never tried to develop it into a commercial ski area, as he did with the golf course. He was going to build houses on it. Clearing the portion on my side was likely a part of that strategy. It was pretty steep, and I didn't quite understand how he was planning to do that. I also didn't completely realize how big the mountain was. But he had been seeing it from all angles during his years of flying around it. About 15 years ago he did that and there must be 60 high-end homes/condos on it now, most with magnificent views. It's a high density development with 2-4 units in each structure. They've also made major topographical changes, taking off at least 100 feet of vertical and creating a large plane for the area where the homes are now. Here's a link to the Google Earth view of my old property, with the Kallander property to the west and north. Pre-development, there was a north-south runway where Kallander Drive now is. Where Kallander Field now is, that was the runout for where he would climb the mountain's west side with his plane, on the run that we cleared. The Kallander Hill ski area was just to the west of where Carriage Lane enters the development on the north side. But it looks like they must have taken millions of yards of fill out of there. Much of that could have been used to develop much of that part of Southborough and framingham where Staples, Bose, CA, EMC and many other companies now have major facilities. The area looks nothing like it did then. Peter Kollander was instrumental in founding the Southborough Open Land Foundation (www.solf.org). The attached SOLF Newsletter pays tribute to him and describes his contributions, including land near where the ski slope once was. The picture on their web page is of Peter and his grandson. Thanks Mark! We hope to have some historic views of this area soon.